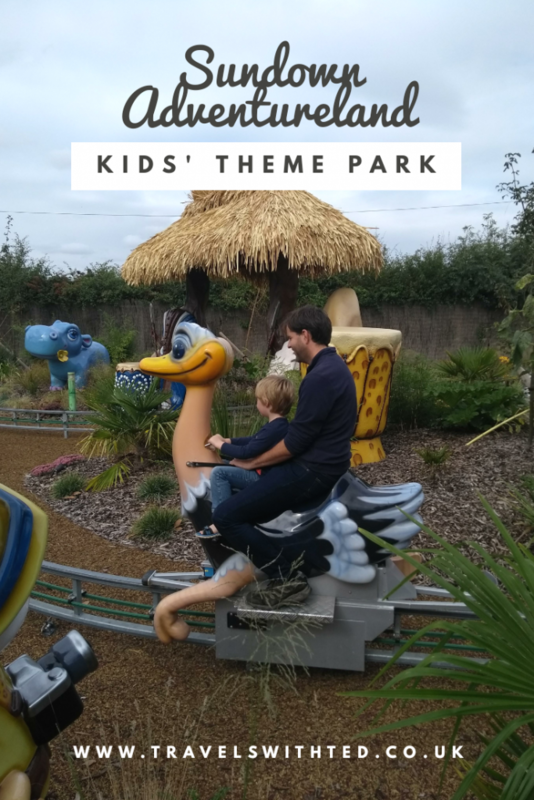 Sundown Adventureland – Our Favourite Theme Park? We love Sundown Adventureland. It is unbelievably tacky which we know isn’t for everyone but we embrace it and it makes me feel happy. Sundown Adventureland is marketed as a theme park for the under 10s. The best thing about this is that all kids can go on all the rides with an adult, there are no restrictions. 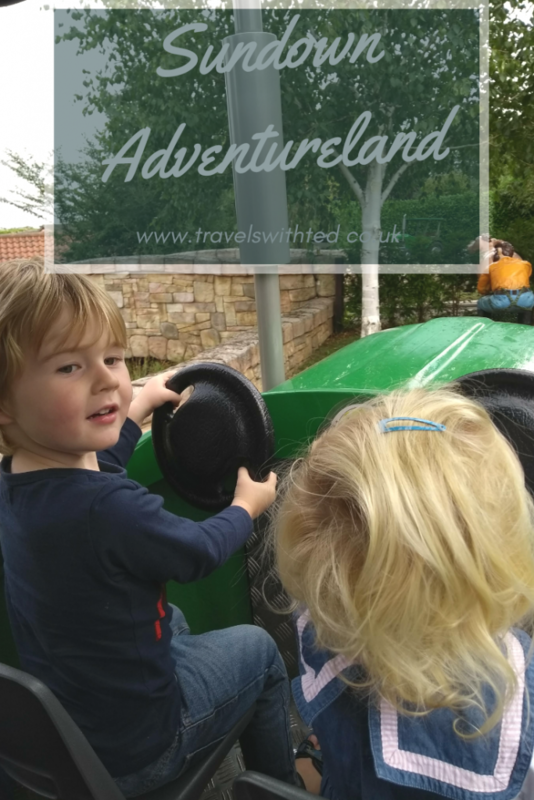 We first visited Sundown Adventureland when Ted was 22 months and we were looking for somewhere to break a long journey. We spent most of our 20s travelling up and down the A1M so we had seen this place signposted along the way. It wasn’t as close to the motorway as we had hoped but it looked good on the website so we decided to give it a go. We loved it so much we returned 8 months later with a 6 week old baby. This time we planned the trip around the visit. We booked a hotel/apartment on booking.com so we could spend the night before close by. I promise to write a useful post to help plan your day in the near future. For now I will give you an idea of what to expect. Sundown Adventureland is divided up into different themed areas, each with an associated ride, play areas and odd animatronics. The areas include the wild west, a pirate town, a farm yard, toy town and many many more. Some areas haven’t got much going on, others you could spend all day in. To take the wild west area as an example. It’s the first area you come to is you turn right as you enter the park. You will find yourself walking down the street in a town in the old west. Most of the buildings on both sides can be entered and have activities and games inside. The barbershop has bubbles and signing coming from it and in the general store you can use the mounted guns to shoot mice. It’s easy to walk past but on the right as you enter the street is the entrance to Fort Apache, an absolutely enormous play area for slightly older children. Further down the street is the entrance to a western themed soft play area and café. At the far end is the associated ride, a classic runaway mine train. It doesn’t go especially fast but Ted would still happily spend all day on it. The wild west area is probably the busiest at Sundown Adventureland. There is one other stand alone soft play area and café. There are plenty more rides, interactive activities and play areas though. We have been in both December and June during term time. I have no idea how busy it gets during the school holidays. The theme park is spread out over a large area so there is room to absorb a lot of people. There’s also plenty of things to do that don’t involve standing in queues. I would always favour off-peak times though and they do offer cheaper tickets for these. During off-peak times the rides run on a timetable which you are handed when you enter. This makes absolute sense and is an easy system to follow. It does mean you end up chatting to the same staff at each ride but since you rarely have to wait more than a couple of minutes it’s not too awkward! The rides are all open frequently enough and for long enough periods that you don’t miss out on anything. When are We Returning to Sundown Adventureland? At nearly 3 ½ years old Ted is pushing it a bit with the potty training. I’m sure at this stage he must be perfectly capable but he’s just not interested. It’s our fault too. We lead such busy lives it’s hard to string a few days together when we can just get it done. Why am I telling you this? (Other than to remind you that anyone who says potty training is easy is either lying or very lucky.) It’s because one of the many tactics we have used to try and get Ted interested (and we’ve used them all) is the promise of a visit to Sundown Adventureland when he’s in pants. This means that every time he looks at the potty he asks if he can go on the flying pigs now? Well Ted, pigs will fly when you are potty trained. 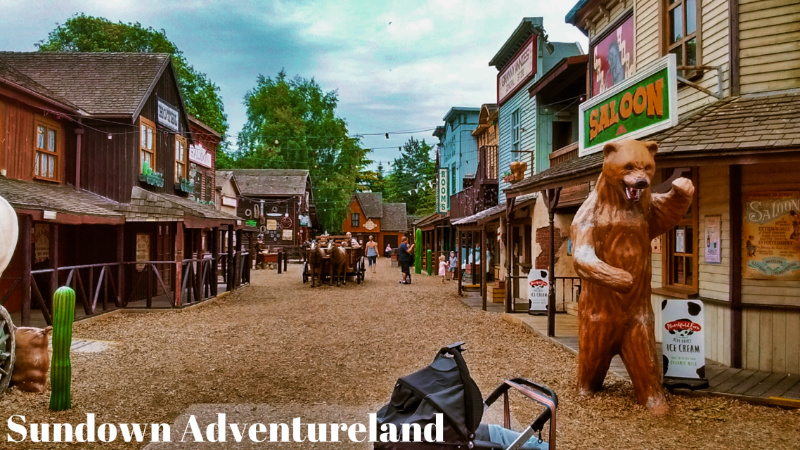 How Does Sundown Adventureland Compare? 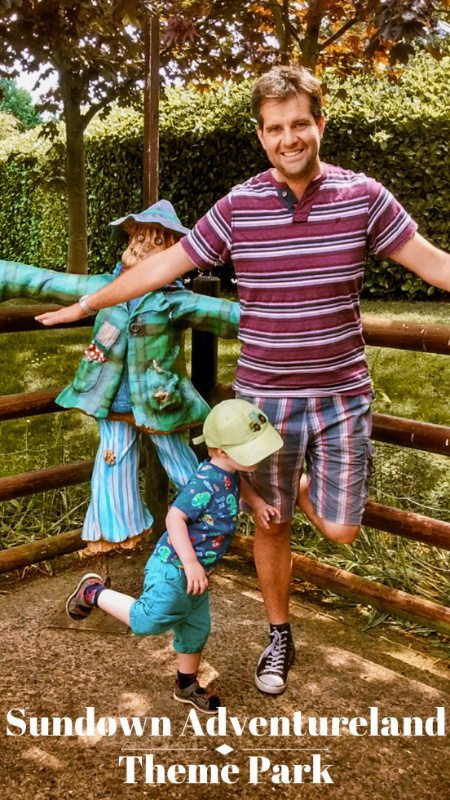 We visited Cbeebies Land at Alton Towers recently and found we couldn’t stop comparing it to our favourite theme park. Sundown is undoubtably lower budget than Cbeebies Land but we like it so much more. I’m not sure if that’s a controversial statement! Whereas Cbeebies Land is very compact and a little claustrophobic, Sundown Adventureland is spread out over a large area. At Sundown the rides are the centrepiece but there is a lot of emphasis on making sure there is plenty to do alongside the rides. At Cbeebies Land there is not much to do away from the rides. There are activities to do in the queues (not enough) and some areas that are not rides (Nina’s Science Lab to name one) but it still feels lacking. Posts to help you plan your day at both Cbeebies Land and Sundown Adventureland will follow in the next few weeks. 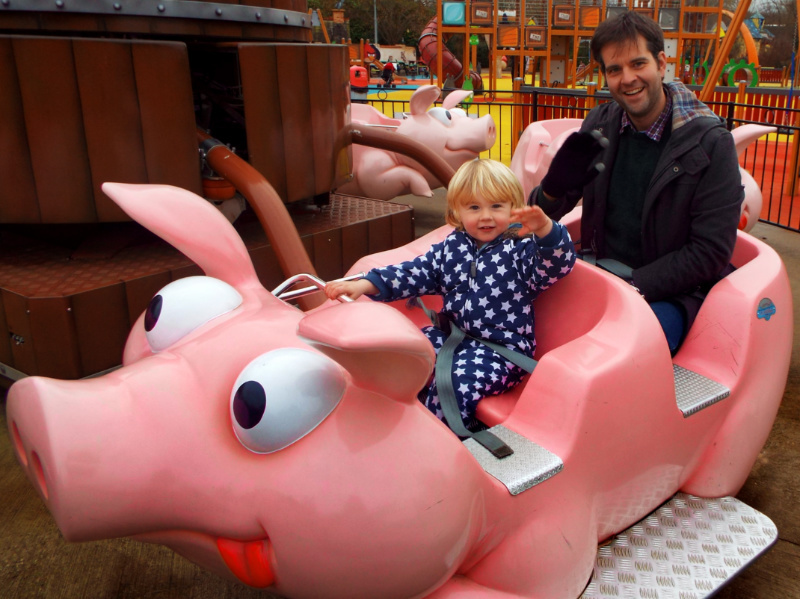 Have you been to any other theme parks for under 10s? What did you thing? I would love some recommendations! 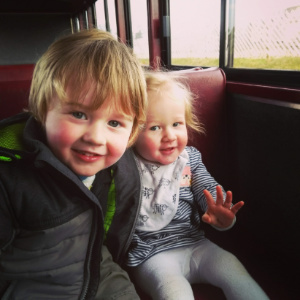 Festivals with Under 3s – Brave or Stupid?